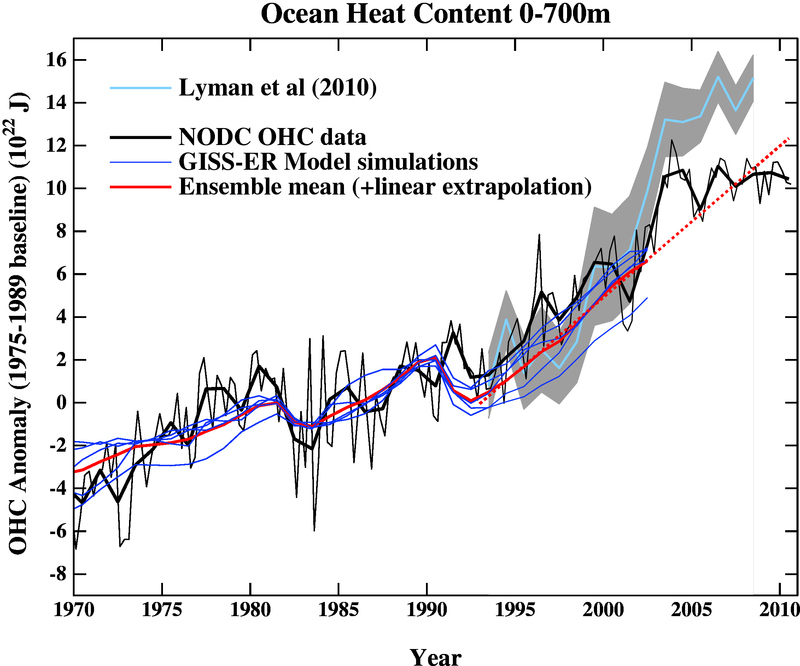 Notice that from 2003 to 2010, the observations are higher than prediction, then lower than prediction — but overall OHC (actually OHCA, ocean heat content anomaly) has been pretty close to its predicted values. But then, that’s the honest way to compare them, which of course is not acceptable in some quarters. According to it, ARGO floats have been in use since the early 1990s, but they had very limited use until the late 1990s. 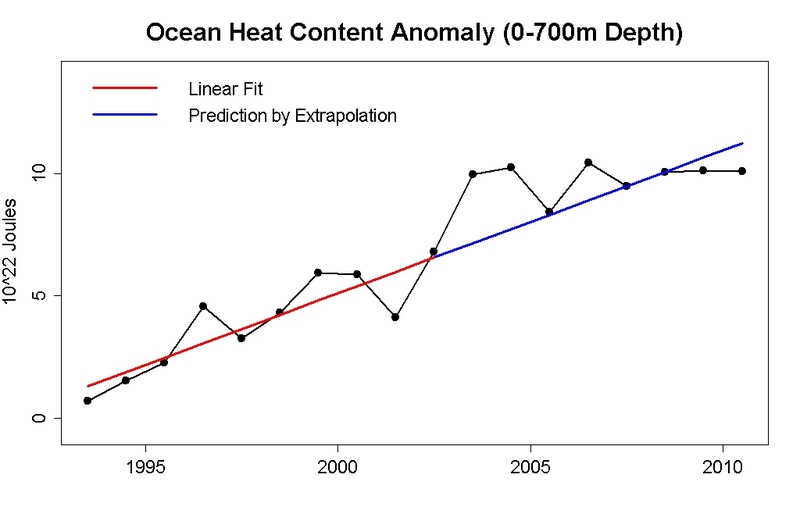 ARGO use began to rise then, and in 2003, ARGO-based temperature readings at depth became dominant. Based on that, I’ll use January 2003 as the start month for the “ARGO-era” in this post. If you want to start at the highest residual, the cherriest cherry-pick, the one which gives the most dishonest impression of the trend, start with the point circled in red. My opinion: that’s why Tisdale chose 2003. Sorry, Bob. When you try to match a line’s slope, but then shift that line upward, choosing the intercept deliberately to make the prediction look as bad as possible, that’s dishonest. It’s also one of the most common tricks that many denialists have used to “hide the incline.” That, and cherry-picking, just might be their favorites. 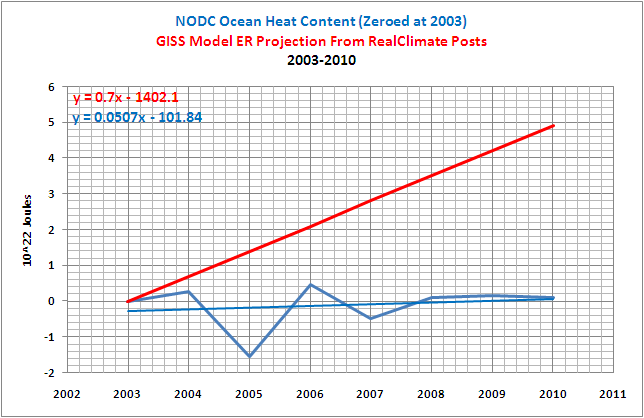 in this post comment 36 Gavin says that models where not used to calculate ocean heat content past 2003 , so no one is using actual model output during this comparison. 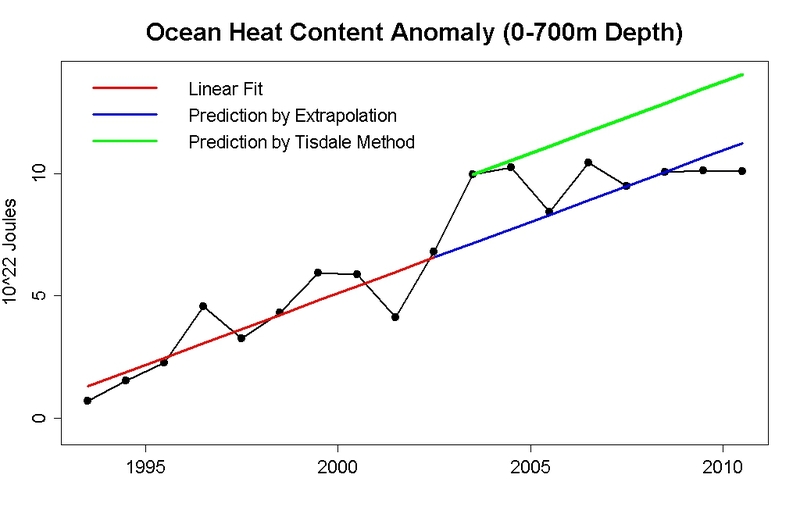 The tough question is how to calculate ocean heat content uptake from model output, any ideas? To “de-tisdalize” data is like de-noising it, in some ways. So sad. Oh, DE… sorry, I got lost in the negatives… My bad. – Excellent post! I just knew it was a circle. – No, take a look at it. It’s a rectangle. – Seriously – look at it. It’s a rectangle! This is an epic demolition. So, did Tisdale learn this technique from Monckton, Monckton from Tisdale, or both from someone like Singer? However, I am certain that many on there are computer personas generating random comments. At WUWT, Watts bans people who rebut the most stupid posts, if you are a repeat offender. I had a good time, correcting some of the nonsense, until Watts banned me. You are not the first, nor will you be the last, person who gets banned from WUWT for posting actual science. I’ve found that if you post your correction following the rules of the road you’ll get through. Mine do. I had to make a very childish public apology. I offered to retract the generalisation (see link above) but refused to apologise for the whole statement. I DO NOT apologise unless I mean it! Why do you think there are so few dissenting views on WUWT (and CA) – Banned or edited or cut is the reason why most do not now post. At WUWT if you post links to images such as mountain top removal when somebody posts about windmills being ugly. Surprisingly enough your text makes it through, but the link doesn’t, not even the html code. Wonder why that is? Better secure those hot beverages, folks — laptop keyboards aren’t cheap to replace. I will be replying to Tamino’s post soon, maybe later today if I get the time. Once again, Tamino’s criticisms fail. He misses the very obvious and the not-so-obvious. But we can discuss that after I post it. I know that myself, and likely many others, will be anxiously awaiting his explanation for such a dishonest tactic as this. If you are wondering why I blurred the number, it is simply that given what has transpired, with preemptive strikes by NCDC, and the recent BEST ambush before Congress, I’m simply being cautious. We are preparing an SI, and there will be the ability to replicate the work. That’s bad enough, but the worst part is that they’ll never get more than 100%. I imagine that he didn’t get 2003 from a residual analysis but eye-balled the year to cherry pick. It’s sad – mostly because he really thinks you are wrong. It makes my brain hurt to think of what his rebuttal will look like. I think he may be choosing 2003 based upon the quality of ARGO data. Josh Willis discusses it with Pielke Sr. on his blog. People who have not read Hansen’s draft paper on the energy balance should take a look. von Schuckmann is a co-author, and she has a paper in 2011, as well as last years paper, on OHC. I have to agree with you about “Bob’s trick” shifting the intercept had no more validity than changing the slope. You point about cherry picking the period is also valid, it is so short as to be misrepresentative and is misleading. I will now make the same point about the original GISS projection. Using just the last decade available , the period 1993-2003 , was equally cherry-picking. It has the steepest trend and the data goes back to 1970. There are clear up and down trends in all these climate indicators and selections going trough to peak are neither helpful or realistic. If RC had used the whole period they would have had a slope about half that which they chose to use in their graph. Bob’s trick is completely dishonest but you should apply some of your criticisms of his techniques equally to your friends at RC. [Response: Hmmm… did you do a change-point analysis to find out where the slope changed with *significance*? Did you test your “single slope for the whole period” theory against alternatives? Do you actually believe a single slope for the entire data set is a realistic model? If it is valid, then why is it that the extrapolated trend line in the RC graph actually is a good prediction! Provided, of course, you don’t fraudulently alter the intercept to make it look bad. Anyone know Tufte who could invite him here? He should use this. I think we need rules on determining trend lengths for blog posts. Here’s an idea: if you want to show the current trend, then you should include all the data required to make a statistically significant trend – no more, no less. I think this would at least remove the cherry picking ‘no warming since blah blah’ posts we see. Thoughts? Perhaps you’ve seen this Tamino post => How Long? As long as it tends to hide the incline. “witchtistics”: use of a “witch stick” (eg, least squares regression) to “divine” the global temperature temperature trend (or other climatological trends) over short time periods. Wow. I see that he relies on posting such long, unedited drivel that nobody will ever bother reading it all to see whether he actually proves the points he claims he does. Needless to say, Tisdale is as usual completely full of it. His “rebuttal” is just an excuse to recycle his fantasy graphs while making some new glaring errors of analysis. And we are left, as always, uncertain whether he is just wildly incompetent or a really clever, malicious scumbag. And, as always, my money is on “both”. Clever and incompetent are not mutually exclusive. I do agree that his response seems rather lengthy. For those of us who will bother reading it, were there particular “glaring errors of analysis” that you would like to draw attention to so I can look for them? He seems to have addressed the two main complaints raised against his original paper. Did he not pick 2003 as a starting year BEFORE that year became the best “cherry pick” year? I’m surprised nobody is actually discussing the content of his response. Calling someone “incompetent” isn’t particularly helpful. [Response: He certainly went off like a raving lunatic, frothing at the mouth. Certainly pathetic, almost pitiable. 2003 is a super-cherry. That’s why he picked it. When he claims otherwise, he’s telling a lie. And pray tell, what excuse did he give for shifting the intercept to the observed value in 2003? Candidly, I don’t perceive “frothing at the mouth” on Tisdale’s part; I’d characterize the tone as “faux reasonable.” Maybe it’s a subjective thing. But while there’s a lot of verbiage there, there isn’t anything that addresses the basic problem of attempting to pretend that there’s something significant about a “flattening” that is far more likely to be noise than signal. [Response: 6000 words — an extreme “gish gallop”? Titled “paper training Hansen’s Bulldog”? Even going so far as to criticize a *different* post (putting noise back in to counter simple 5-year averages)? Methinks he doth protest way too much. Crob: The reason Tisdale’s endless nonsense is so vexatious is because it takes far too long to unravel his lies and obfuscations. Frankly, nobody has the time. But why should it matter? The basic errors are obvious enough, and don’t require detailed analysis. A comprehensive take-down is simply not required. Here’s a simple question for you: if Tisdale chose 2003 innocently, then why does he also claim that he chose it because it shows ” how flat the data has been since then”? If that had been his goal, and 2004 really was the “cherry-pick” at the time, why didn’t he start there? His whole argument doesn’t make sense, and that’s why we don’t need to bother going to the trouble of determining the truth of each individual part. There is a Latin phrase, Ex Falso Sequitur Quodlibet, known as the principle of explosion. It means anything follows from a contradiction. And since many of Tisdale’s errors contradict each other, he can literally prove anything to be true. But it’s all nonsense…..
You think Tisdale’s post is long? A full explanation of each error he makes would fill volumes. Yes..Didactylos, Tisdale does seem to contradict himself regarding the “cherry pick” claim, saying at first that he didn’t, but finally arguing that he has every right to pick whatever start he wants. If you read his argument carefully, however, I think he is making two different points and they don’t actually contradict. 1) Tisdale was specifically accused of “starting at the highest residual, the cherriest cherry-pick, the one which gives the most dishonest impression of the trend, ..that’s why Tisdale chose 2003.” If Tisdale is correct that at the time he first chose 2003 as a start date, 2003 WAS NOT the highest residual, then this “highest residual” method of idenditying cherry-picking actually shows that Tisdale DID NOT cherry-pick because he didn’t pick 2004 as he should have if he was really looking for the “cherriest cherry-pick” at the time. 2) Tisdale goes on to argue that, even if he did pick a specific range to prove a point that he has a right to do so. His point was not that the model NEVER agrees with OHC, just that it doesn’t agree well after 2003. If that is the point you are making, then showing a graph since 2003 makes perfect sense. Why does this contradict point 1 above? Comment to moderator: My original response to Didactylos was that his assertion that Tisdale was “incompetent” without actually outlining any of the “glaring errors of analysis” was not helpful to someone who wanted to understand why Tisdale is right or wrong. I don’t care about the infantile language, just that there isn’t anything left after you take the name calling out. Many of the comments at WUWT are equally unhelpful and I will comment on that in the future. Yes, Crob, we understand that Tisdale has the right to cherry-pick if he wants to misrepresent reality. Why on earth would he say anything different, given that cherry-picking and selective arguing is what he specializes in? And why on earth do you defend this? Because Tisdale has a history of lying. Why would one want to assume he’s not, now? After all he goes on to claim he has the right to lie (by cherry picking) if he wants. Sucker or troll, which are you? Sucker, troll or sock-puppet – I just don’t care. When I say Tisdale’s blatherings aren’t worth the time, I mean *my* time. Let Crob enjoy wasting his. Can someone answer a small Q I have on this….? Is the additional long wave radiation from a warmer atmosphere the cause of the rising OHC ? I’m not a sceptic, but I’ve long wondered why the ocean is warming at about the same rate as the atmosphere but has more than 1000x the heat storage capacity. Is it possible that there is a cause other than atmosphere warming the oceans? Also, can someone provide the maths showing how this energy transfer works ? This is all very interesting ! Science of Doom did a four-part series, the last of which is here. There are links back to the earlier posts. From what I’ve read, I do not believe there is another cause. OHC is increasing because of GHGs. I’ve long wondered why the ocean is warming at about the same rate as the atmosphere but has more than 1000x the heat storage capacity. The part of the ocean that tracks the rapid, ongoing atmospheric warming is much smaller: a few hundred meters max. Much less heat capacity. The transfer of heat from there to the deeper ocean is much slower, it is effectively a separate reservoir. Yes, Girma wants to know if the heat in the deep ocean might be trapped there forever: unavailable to heat the earth at all. Well, other than that part of the earth otherwise known as the deep ocean. More than 1000x heat storage capacity? Must be right as it’s so far left without objection… and an experiment conducted by some NASA/JPL folk mentions 1000x too and makes it very visible with a balloon. 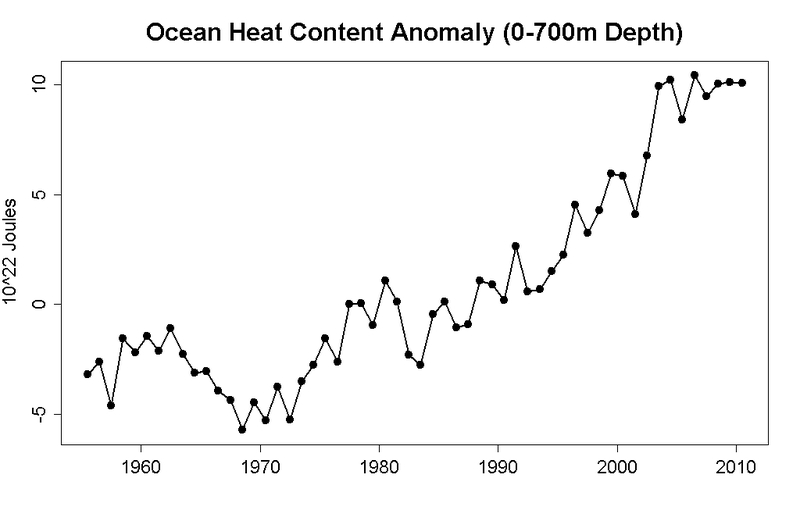 The deep ocean has apparently risen by 1C in the last few decades. Now that’s a pile of heat. The WUWT crowd [+ the Pielkes] probably will be quick to claim it’s those under sea volcanoes, same as those other volcanoes under the Antarctic Ice sheet causing that increased melt [not of course]. I read the series from Science of Doom and discovered that DLR only warms the skin of the ocean and causes more evaporation and possibly cools the top few millimetres. However the shorter waavelengts from the sun penetrate deeper into the ocean and can warm down to 100m. In summarising my reading so far on this subject I have found that the incoming solar radiation does not warm the atmosphere but passes through and warms the oceans. Outgoing LR from the oceans warms the atmosphere, and this warming increases as we add GHG. But DLR does not penetrate the ocean and it is still unclear (to myself) how it can warm the ocean. So I am still confused as to how GHG can warm the oceans. 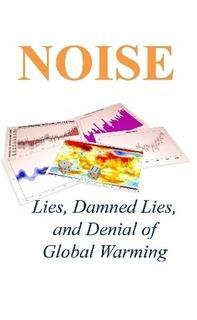 Does NOAA or NSA measure & keep records on DLR at sea level.? If we could measure how much additional DLR there has been over say 30 years and then work out from OHC how much energy has been added to the oceans over that time then we could compare the energy of the two and see if they add up. Has anyone made this calculation ? You’re welcome. As to your (generic) physics teacher, you cannot know every detail of every section of physics so that’s no surprise. As I read the series, it says you’ve got cause and effect mixed. DLR does not cause evaporation by itself, it’s the energy of both incoming solar and DLR that causes the temperature boundary layer to be higher then if you consider only incoming solar energy. A boundary layer with a higher temperature requires the deeper ocean to have a higher temperature for it to sustain the same flux (deltaT) through the boundary layer to the atmosphere (the deeper ocean (<1 mm) still needs to loose the solar energy or it would start boiling eventually). Therefore a bigger GHG forcing (i.e. more DLR) causes a warmer ocean. It causes higher evaporation too, as the boundary layer is warmer but that is just a negative feedback effect that helps establishing the new (higher) equilibrium temperature. At least this is how I understand it. It may sound denigrating which is certainly not my intention, but I think you should read the articles again (part two). Some of the commentators in the comments section seen to put forward very confused alternative theories (which is actually the subject of that series! ), but those are way outside the mainstream understanding and thus should be considered very sceptically and perhaps only if you feel confident to have understood the physics well. "Does NOAA or NSA measure & keep records on DLR at sea level.? " You are oversimplifying the energy flows a little. Refer back to this familiar diagram of the earth’s energy balance. You will instantly note that some incoming solar energy is directly absorbed or reflected by the atmosphere. The rest is reflected or absorbed by the surface. The atmosphere and ocean surface are roughly in equilibrium, driven by wind action, precipitation and evaporation. What this means is that as the atmosphere warms, so does the ocean. It’s not a simple outcome of direct warming from DLR, it’s an entire coupled system. Those people helpfully pointing you to the Science of Doom posts were serving up a bit of a red herring, because while the amount of ocean warming due to DLR is interesting, it is missing the point that there are all these other processes transferring energy, and to answer the question “how is the ocean warming?” all we need to know is that the atmosphere and ocean surface are roughly in equilibrium. Not exactly balanced, obviously. It is the regional differences that are linked to weather and other climate phenomena. I think you already understand the mechanism of ocean mixing, which gradually transfers heat deeper into the ocean. Didactylos, I would disagree a bit. The ocean has a something different happening and it needs to be better explained to the public. When people learn that long wave penetrates just a few microns, they easily come to believe that long wave is not heating the oceans. So what is happening in those few microns is very important to understanding. In my understanding, the temperature gradient is altered by the presence of additional GHGs in such a way that the loss of heat from the ocean is slowed, so OHC, of course, continues to rise as GHGs accumulate in the atmosphere. I also believe there is significant downwelling from the ocean skin of LW heat. On RC people talk as though this is so obvious it requires no broader explanation, which is probably true for ocean scientists. Reading the comments at S0D, and at RC, I disagree. This is an area where it is very easy for magicians to bait and switch. Based on his exaltation of Excel as the arbiter of all linear slopes, I suspect incompetent. Tisdale could have just clearly and briefly defended why he set the y-intercept to zero at 2003 in a short post if he had a decent defense. But evidentially he doesn’t for he chose instead to write a novel length post. OK I did a quick and dirty examination of Tisdale’s claims using confidence intervals. It clearly confirms Tamino’s analysis. Details/replication instructions here. 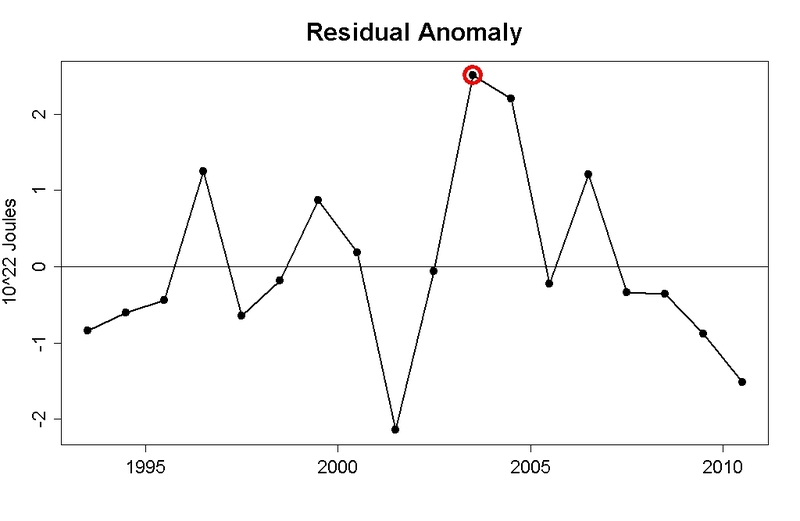 Given that the period from 1993-2002 is relatively short (climatologically speaking), it’s undoubtedly a bit of a coincidence that the two trend lines (for 1993-2002 and 1993-2010) turn out to be as close to co-linearity as they do, but what is says beyond any reasonable doubt is that the data from 2003 -2010 “follow” the extrapolated line (with noise) just as would be expected if the (apparent) trend from 1993-2002 has continued (which it certainly appears to have done). How long has this been goin’ on ? Way too long has this been goin’ on. Talking of Mathurbation and hiding the incline and cherry picking. Read this unbelievably stupid post by Roy Spencer– delicious fodder for the skeptics and deniers. Spencer is amazing, a walking contradiction in terms. For the fun department, take his UAH 5.4 recently re-baselined ’81-’10 monthly temp data, then apply a 38 period moving average and ”eyeball” something completely different [don’t think this is anything at all novel]. Is there cyclicity and does it not appear like each subsequent dip bottoms out higher than the previous?… then ogle the right tip going where El Nino starts kicking in. PS, The RSS 3.3 shows same but less pronounced. It reads like chumming to me–Spencer avoids drawing conclusions himself, since he knows they are indefensible, but leads the minions to them. I don’t know if that reading is correct, but if it is, then it’s rather a shrewd post, in a sick sort of way.